Hi everybody! 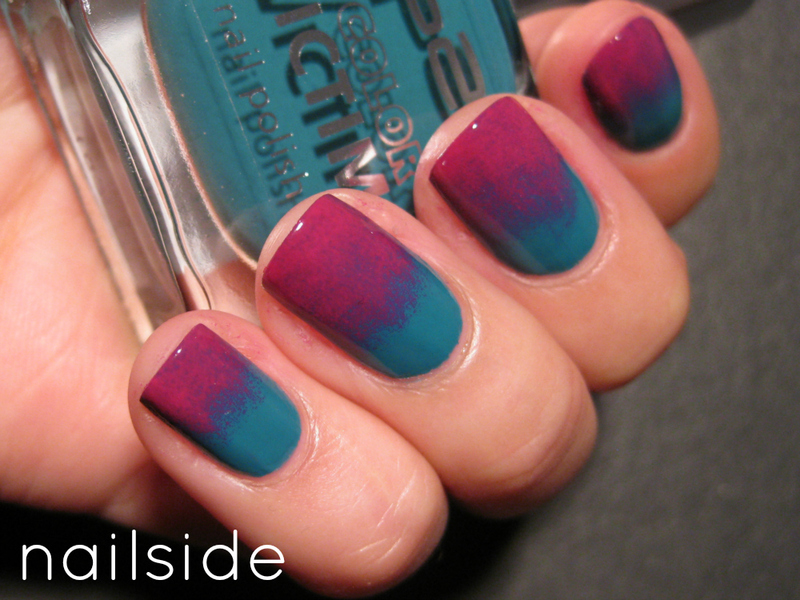 :-) It's about time that I continue with the 31 Day Challenge, so here you have my attempt on day 10: gradient nails. And what a terrible attempt it is... I tried so hard and so many times to get the gradient smooth, but so far this was the best I could do. I do like the colors though, and from a distance it doesn't look too awful. So with a lot more practice, I hope to show you a better gradient next time. ;-) I used P2 Funky as my basecolor and used a fine make-up sponge to dab on Essence Sending You Kisses on the tips. My next post will be featuring polka dots, hope to see you again then! Ooh, I love the colours in this! Actually what I really like about this gradient is that it's not perfectly smooth and blended! It looks kind of punk rock/street art-esque to me and I think the colors look really great together too. this nails are so cute! actually i love it, the colours are great! I like this color combo a lot! I have the same issue with my gradients - they never come out smooth and seamless. Your is very pretty though. Mine on the other hand do not see the light of day and the pics are promptly destroyed- ha! I really like this! It looks liked leaked dye on a t-shirt or something! Hey, don't be so hard on yourself, I think it looks fun and funky! Gradients of two vastly different colours can be tricky. This looks very 80's fab. I like! I like the colours, they created their own in the middle and I think it looks great! I really like this. It looks like your nails are in the process of changing colors. I like this look. It doesn't look like a terrible gradient at all; it looks like a different style of gradient to me. It gives me the feeling of a southwestern U.S. sunset. Whoa, I actually think this looks really cool! Kind of like diluted paints streaked together! The fact that it's not a smooth transitioning gradient is irrelevant :D! OMG this is so gorgeous, I love it!! why if I try it, it's horrible? and if you try it, it's great? I adore the pixelated effect of the gradient, adds an interesting the twist to the whole ombre trend.